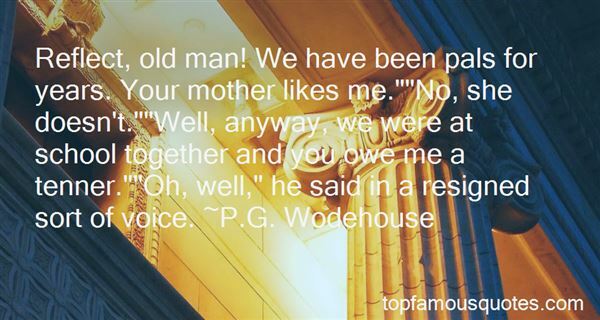 Reading and share top 21 famous quotes and sayings about School Inspections by famous authors and people. Browse top 21 famous quotes and sayings about School Inspections by most favorite authors. 1. "I mean, the acting school I went to, we did have a social experience, but you know, when it's a bunch of actors, it's everyone self-consciously having a social experience rather than just having a social experience." 2. "Historically, absolute IQ scores have risen substantially as we've changed our environment so that more people go to school longer." 3. "It was in high school that I first became interested in acting. We put on lots of plays." 4. "Maintaining order in the classrooms has never been easy and it is evident that the school setting requires some easing of the restrictions to which searches by public authorities are ordinarily subject." 5. "I'm trying to go through the whole process of high school to college to work." 6. "The family is the school of duties - founded on love." 7. "You know how some kids get excited about the first day of school and have an outfit all picked out and a new lunch box and stuff? Well, they're bleeping idiots.Can we play hooky?" Iggy muttered as he scrambled eggs.Somehow I suspect they're picky about that," I said, dropping more bread into the toaster. "I bet they'd call Anne. "I look like prep school Barbie," Nudge complained, as she entered the kitchen. She caught sight of me in my uniform and looked mollified. "Actually, you look like prep school Barbie. I'm just Barbie's friend. "I narrowed my eyes at her." 8. "Some day I will be famous but for now I am stuck in middle school with a bunch of morons"
9. "You'd think someone who'd been to medical school would be able to hear through a stethoscope that somebody was empty inside." 10. "For my senior year, I'm home schooled. It's working well with the acting. Juggling school with the acting is hard, but you know, what can you do?" 11. "I went to film school to make films just because you're in control of the story." 12. "I was a competitive swimmer in middle school and high school." 13. "But I know I didn't love school for school's sake. I had never really been what people call an 'academic' person, nor did I see myself becoming one. Instead, I took pleasure in the fact that my work existed in a social setting, one that was based on the promise of a brighter future. I knew that what I adored about school was that each of my assignments - readings, essays, or in-class presentations - was inseparable from my relationships [...] If I loved school at all, I loved it for what it provided me access to: bonds with people I grew to cherish. And nothing was better than working toward my dreams alongside people I loved who were doing the same." 14. "Why don't we learn about the mental health which affects every minute of our lives? ... Where is the school for learning [about] positive mental health?" 15. "I played piano back in my elementary school days and I sang a cappella back in college." 16. "My ambition in high school was to be a high school coach and teacher, and that's still what I do: teach." 17. 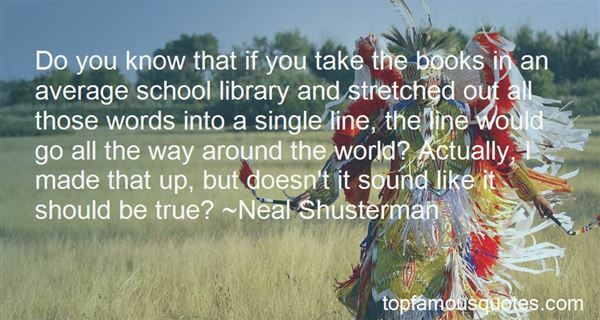 "Do you know that if you take the books in an average school library and stretched out all those words into a single line, the line would go all the way around the world? Actually, I made that up, but doesn't it sound like it should be true?" 18. "Reflect, old man! We have been pals for years. Your mother likes me. ""No, she doesn't. ""Well, anyway, we were at school together and you owe me a tenner. ""Oh, well," he said in a resigned sort of voice." 19. "Really, Sage? A date? "I sighed. "Yes, Adrian. A date. ""A real date. Not, like, doing homework together," he added. "I mean like where you go out to a movie or something. And a movie that's not part of a school assignment. Or about something boring. ""A real date." 20. "I was pretty hot-tempered all through school. I remember my high school basketball coach telling me: 'Boy, if you don't learn to control that temper, you're gonna kill somebody.'" 21. "What students lack in school is an intellectual relationship or conversation with the teacher." We don't see the world as it is, we see it as we are"